The Fishing: Well this was our second year here but at a different time of the year than our previous visit. It would be far too easy to say the fishing was constantly epic and just stick up a load of pictures of big fish to finish it off! No unfortunately, in the cold light of day, you have to work very hard up there for your fish, locating them is the key. When you do finally find them, they probably wont be there in the next hour, day or even week! There is a lot of water to cover up there both area and depth,and although we did concentrate on the shallower marks this year sub 400ft, we did stray into the 500-600ft area on a few occasions. 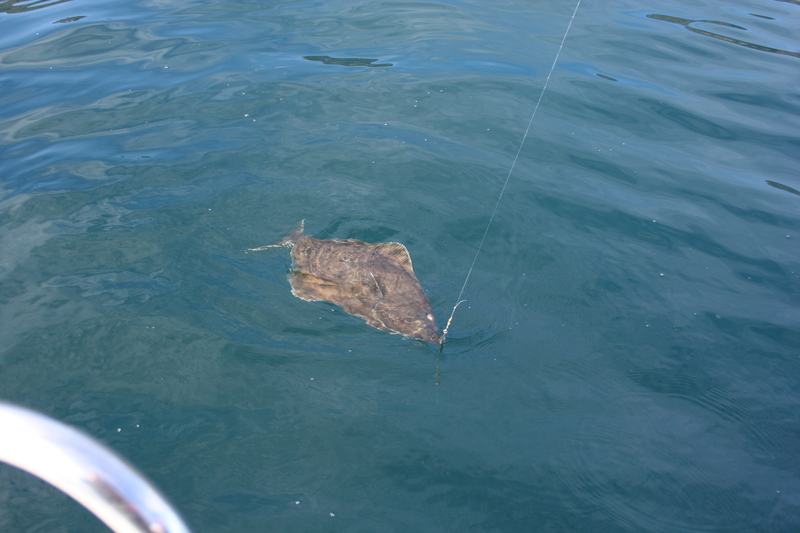 Our Main Target Species this year was Halibut and Coal Fish which we eventually found. 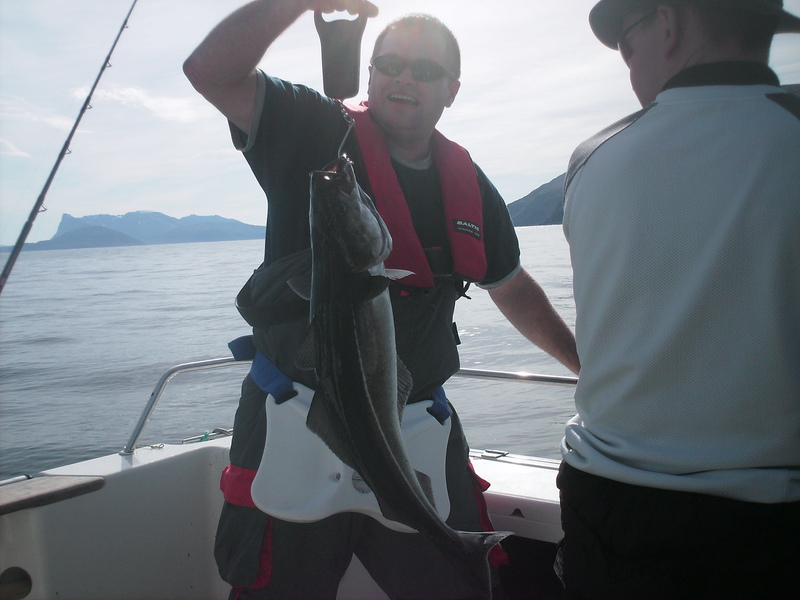 Other species we encountered were Cod, Red Cod, Ling, Torsk, Red Fish, Wolf Fish and Haddock. 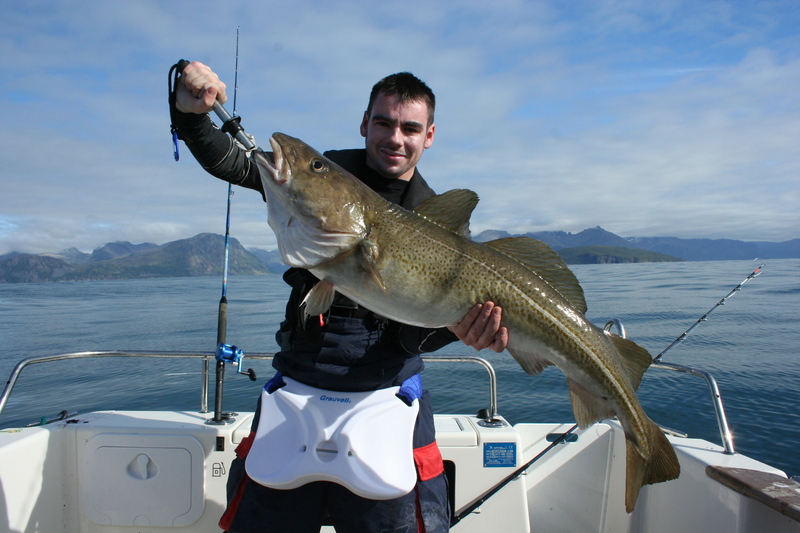 The Cod Fishing was excellent when it was on and was the most consistent of all the species, I do not recall a fish landed below the 10lb mark, the majority of the fish were in the mid teens to 30lb bracket and provided great sport on the heavy and light gear. Barry managed to winkle out a very aged looking Cod late one evening as it was getting dark. It gave him a fantastic fight on the 15lb WaveBlaster and tipped the scales at an impressive 47lb !! 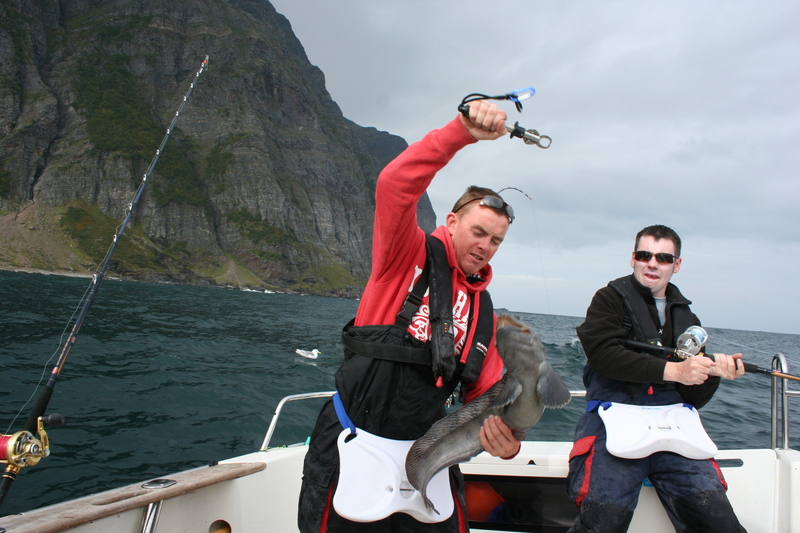 The Red Cod fishing was very scare, we did try different areas for them but we only managed 1 lone ranger. I picked him up on a Chartreuse Savage gear eel attached to a 20g jig head fished Kilmore style! The Ling fishing is available up there but we did not target them intentionally, young Pat pick up a sneaky one inside a deep cove we were drifting. I didn’t get a picture because Pat and the fish had a falling out over a tangled line and neither were in a position for a suitable picture! The Torsk fishing was as it always is up there, good if your into that sort of thing. Now don’t get me wrong there a grand fish to look at but theres more fight out of a plastic bag on a windy day! 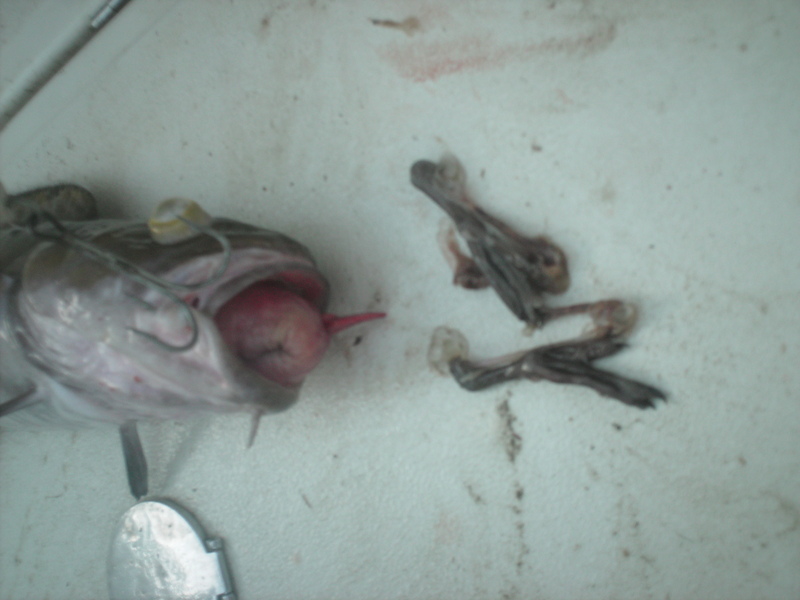 Just imagine your bait fishing for Bass on a perfect tide, all your ducks are in a row for a good night, but every time you cast out within 30 secs theres an L.S.D. 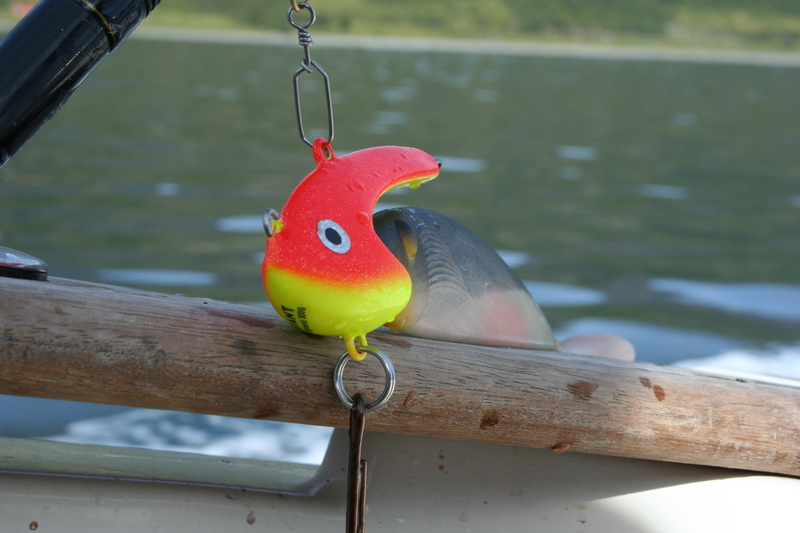 on your bait…get it. Torsk are the L.S.D. of Norway. Hauling them up a few hundred feet each time is no joke either ! I think 13lb was the best one we managed. Barry with his favorite fish. The Red Fish fishing is available up there if your interested, I targeted them because I was interested in catching one. 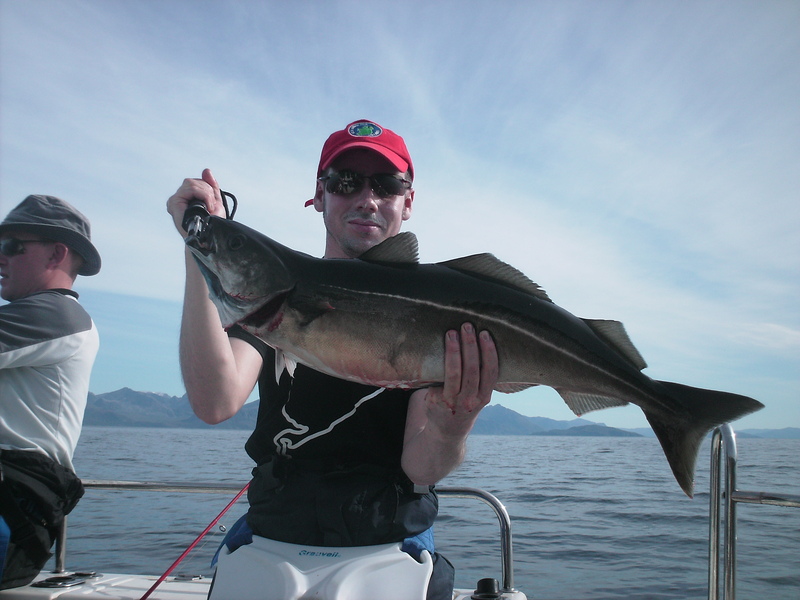 They are a deep water species and it was no surprise then the one I caught was in 600 feet of water in the middle of a Fjord. Cool looking little fella with mad poppy out eyes. 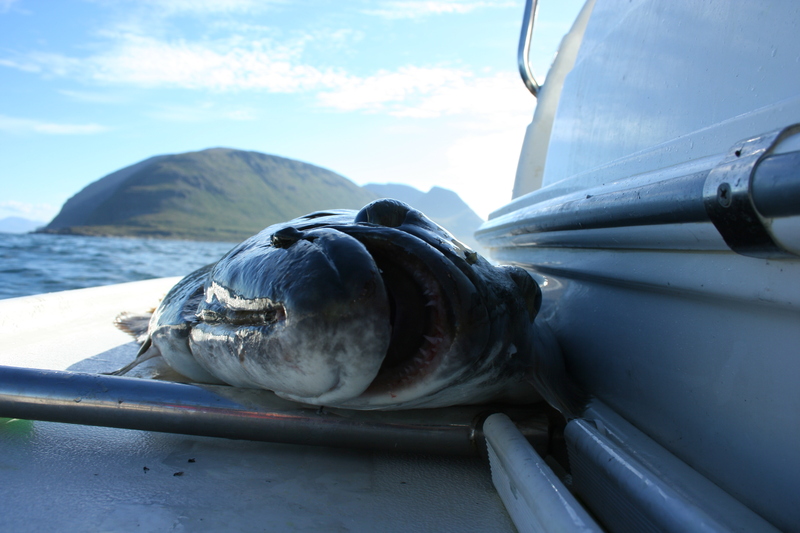 The Wolf Fish fishing has some what of a cult following in Norway, the locals refer to them as Cat fish and prefer to pleasure fish for them over Cod. 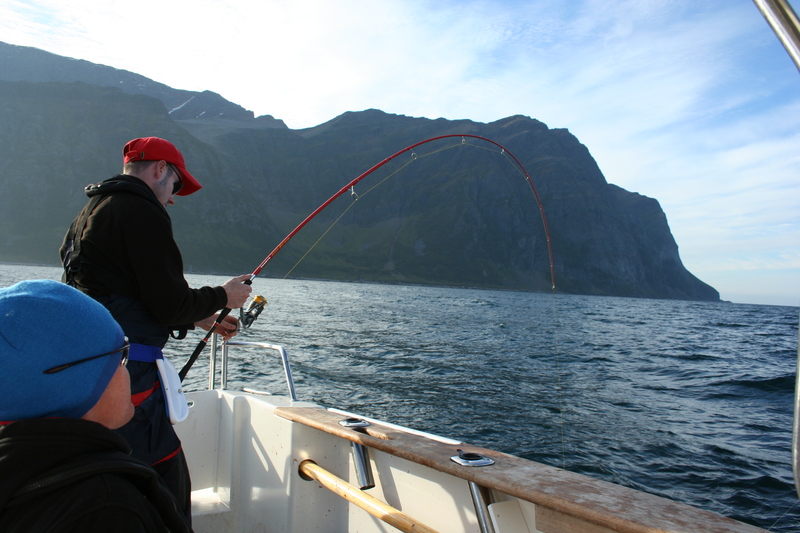 We targeted them one day at the entrance to a narrow fjord and had some good fishing. Great buzz when one lands on deck and starts to snap at everyones feet ! We need a caption for this picture ! 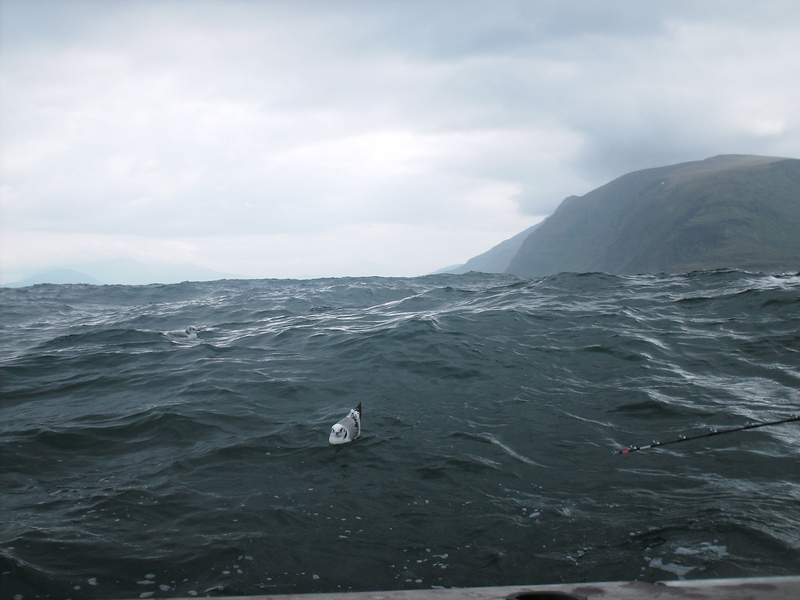 The Haddock fishing up there at times simulated mackerel fishing here 6 years ago, hitting our lures on the way down and becoming a real pain after the novelty wore off. 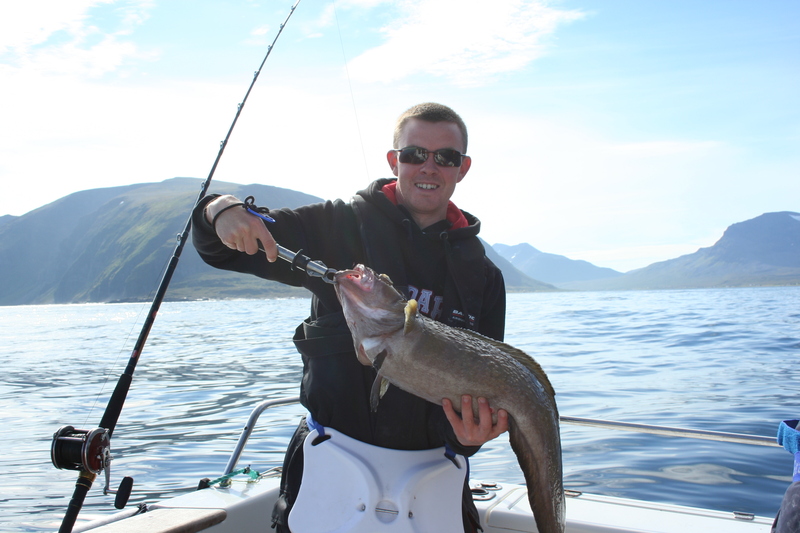 Still though we got some nice fish to double figures and plenty of banter was drawn from them. Ya reckon he looks happy ? The Coal Fish fishing up there was firing on all cylinders the couple of weeks before we arrived, unfortunately we couldn’t locate them in any numbers during our visit except for a couple of hours one evening when the sounder came alive with them. 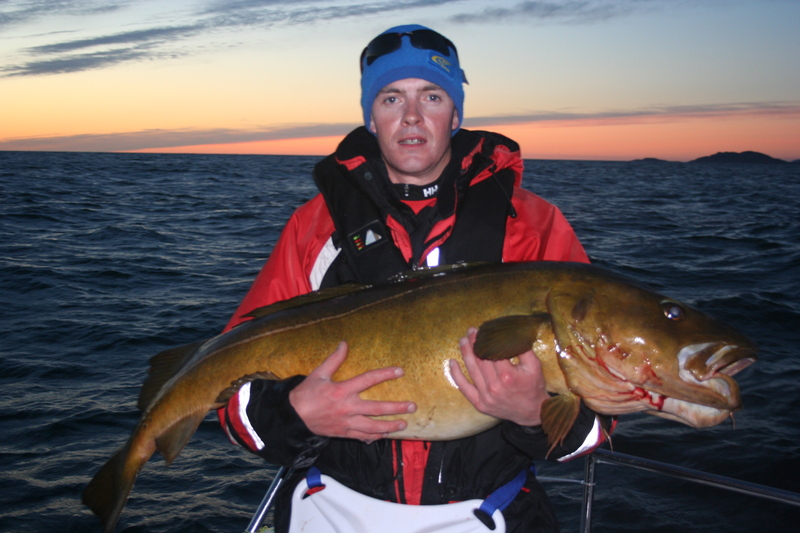 We had some fantastic sport that evening on the Lure Rods, speed jigging for them. 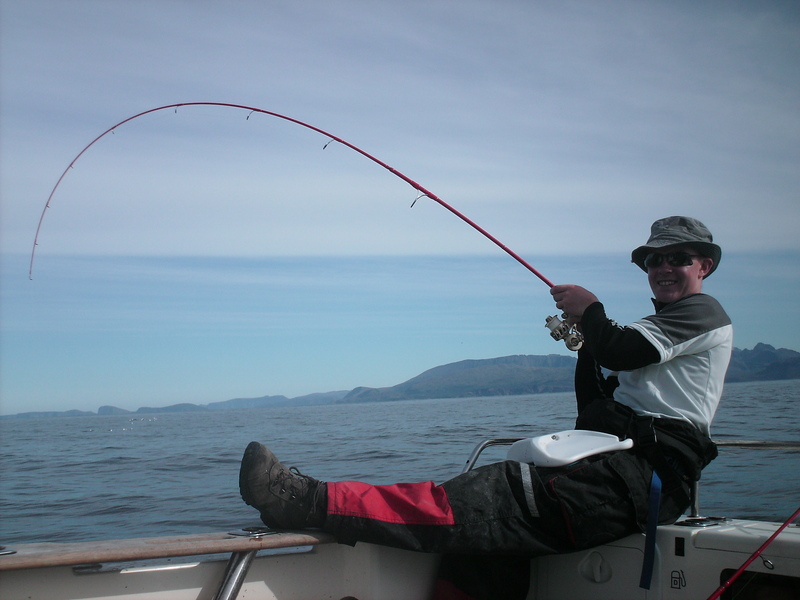 Bang Bang Bang….3 rods bend round as the fish tear off at a rate of knots, these babies know how to party !! The Halibut fishing up there is hard to describe. 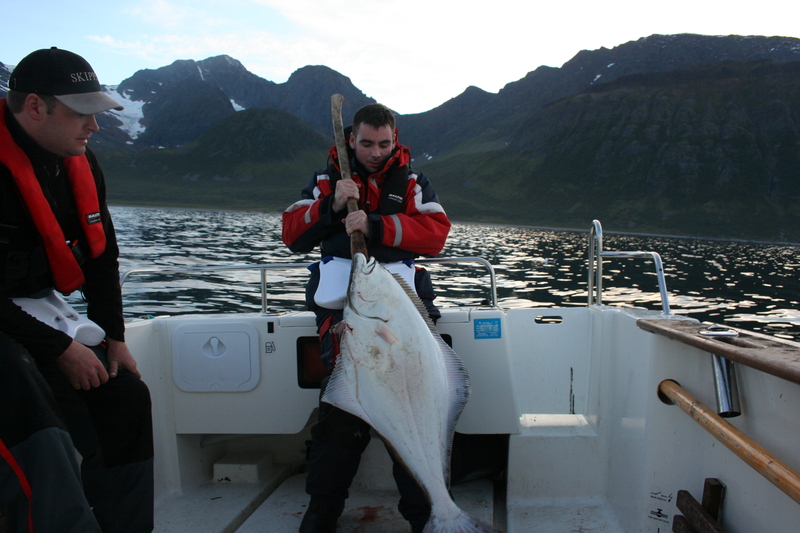 For example we were talking to some very experienced anglers up there who were on there 5th visit and still were waiting on their first Halibut. 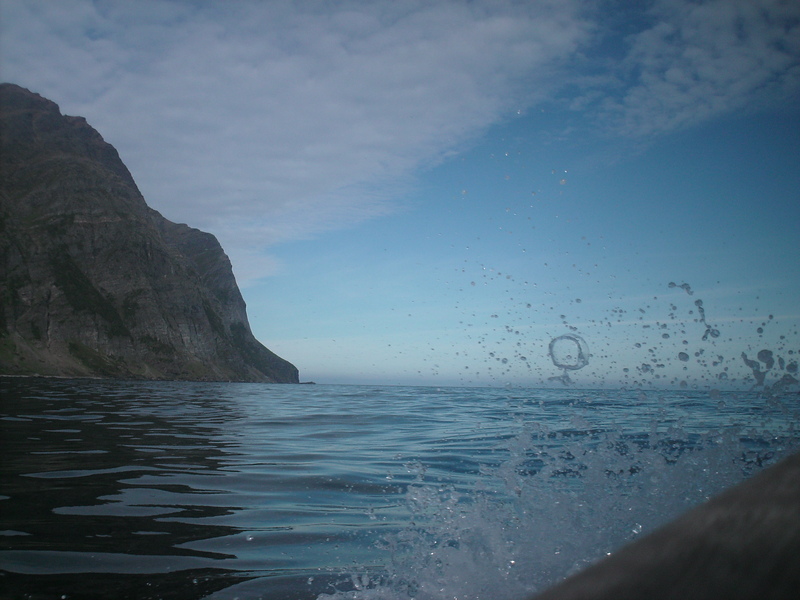 Where as we were lucky and made contact with 12 Halibut best 2 estimate to be over the 100lb mark. Interesting the marks that are supposed to hold them ( shallow sandy bays) didn’t throw one fish for us. Must say though these are a very special fish, and their power is simply frightening. I nick named them the ‘Greater Diamond Back’, Barry nick named them Hayabusa and Pat just says ‘ That is not coming into this boat !’ haha. Look at the teeth on this baby ! The Weather: We encounter all of the 4 seasons during our trip. From T Shirt weather right back to full flotation suits, hats and gloves. The Arctic weather systems really move quickly up here and there is always some form of a breeze or wind. One day we had to bring the boat in as it was starting to get a bit hairy, que an hour surf back to port 🙂 . No sign of any snow though ! The other side of the coin, 15ft swell. The Boat: We choose the Arvor 215 (21ft C class) again. The boat handled the conditions very well, very stable while drifting in large fast swells and the GPS worked perfectly this time around. Excellent fuel economy from the Inboard Cummins 2.0 turbo diesel engine. We used a lot of fuel for our trip this time around, and we covered a lot more water compared to our previous visit. This a fantastic pleasure platform to fish from, my only gripe is the engine cover which extends above the deck line, this becomes a hazard when fishing in lumpy sea conditions. 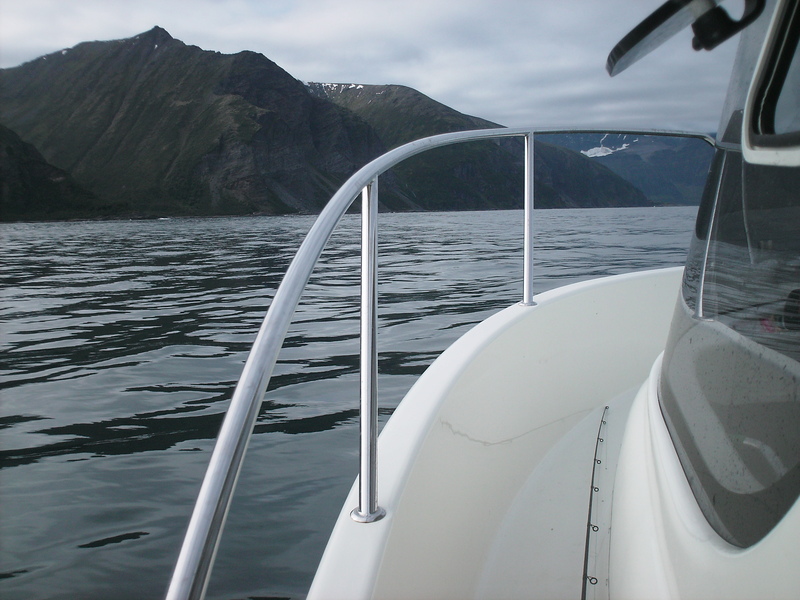 A bow view from the Arvor. 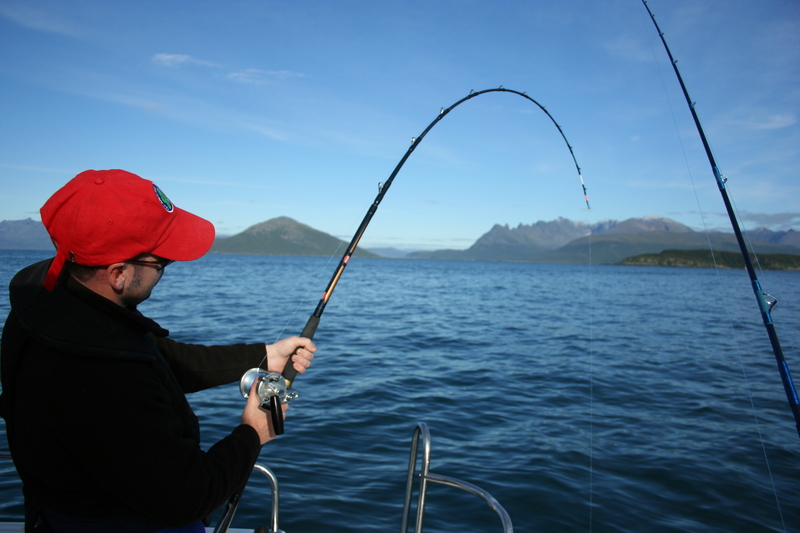 Fishing Equipment: We each brought a Lure rod and a Boat rod (all wave blasters 20/50lb class). Also brought multiple reels Fixed spool and Multiplier. We fished the lure rods where possible, casting up tide and trotting the soft plastics back. 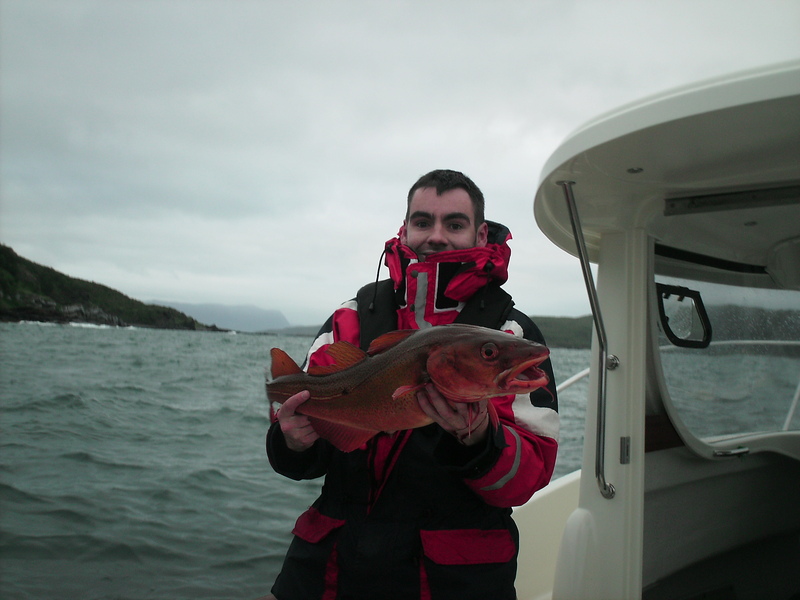 Speed jigging for the Coalies was brilliant craic, the speed at which they hit your lure is surreal for a fish of their size. They sure take the limelight from the Pollock for aggressive takes. 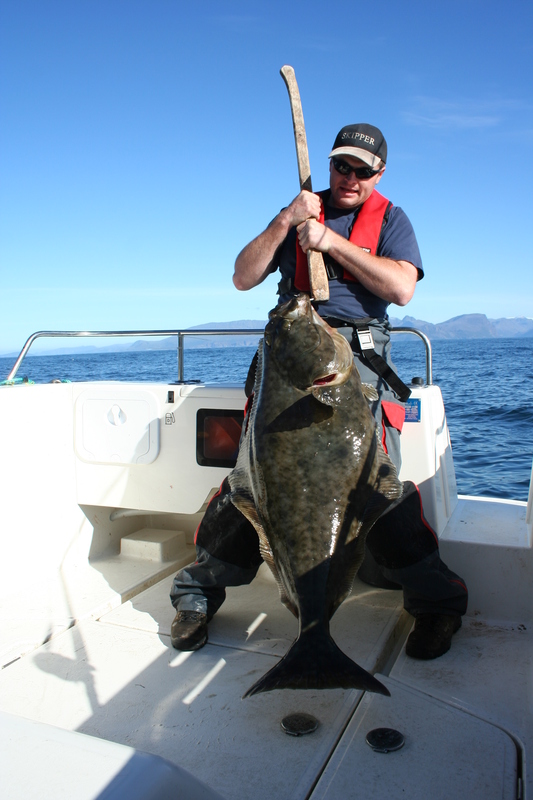 We used the heavy gear when targeting Halibut in deep water, it was just easier on the body. The constant fishing does catch up on you by day 3/4, you would be grateful of fast retrieve ratios on the multipliers. Mainline was 30lb/50lb with a short lenght of 80lb leader on the heavy set up and 20lb on the lure rods. Wiggler 300g and Flashmer 250g lures were the most successful although Barry did well shading on the drift near the end of the holiday. We didn’t use the Plain Jane or Green Goblin this time round ! Torsa. Barry you tackle tart ! Oh we like to fish it light. Giant Jig Head..looks nice ....caught nothing! Whats on the end of this then? Its getting dark, Pat and myself had finished up for the day but last last cast Charlie wanted one more drop ! We had been working an area with a large peak which came within 50 feet of the surface with little success. Ah but Barry was to have the last laugh, He hooked into a substantial fish on his light Wave Blaster and battles it out as the light faded more and more as we bob up and down in a shipping lane. ‘Its a Grouper’ I shout as the Fish breached the top of the water. It was a ridiculous size Cod which looked very aged. We got the pictures in and spent the next 30 mins reviving the fish and getting it to swim back to the deep. What a way to round off an evening ! Yes that is a pair of birds feet ! Did I ever tell you of the great story teller that is Pat Gahan? Seriously this man can tell a sceal or two! Did you know how the Haddock got the famous thumb print just behind its head? 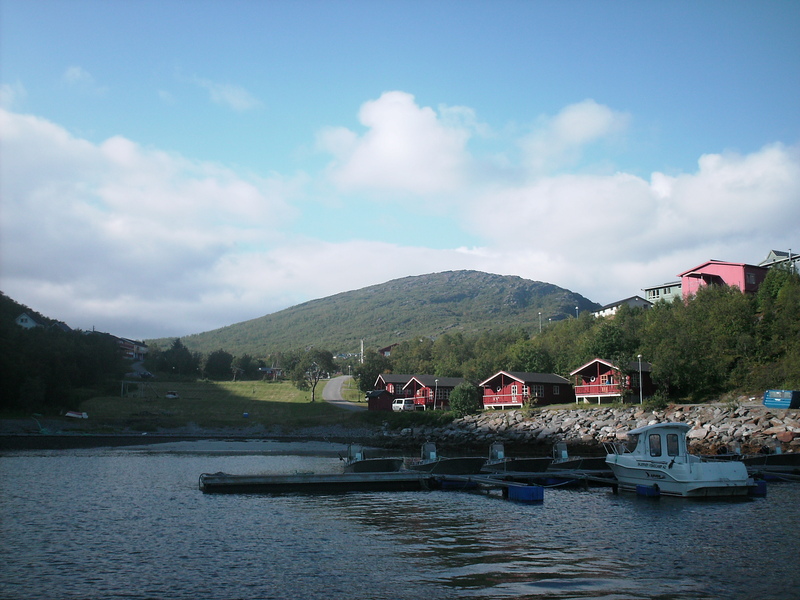 Well legend has it around the Northern Troms region of Norway that Pat Gahan is the man to ask about it !! If you ever meet the man just ask him about the Folklore of the Haddock! The Coalies were proving hard to locate in our area, but we had 2 fantastic sessions where we literally ran into two large shoals of coalies in the 5lb – 11lb weight bracket. Que the lure rods, rapid retrieves and explosive takes resulting in smiles all round. 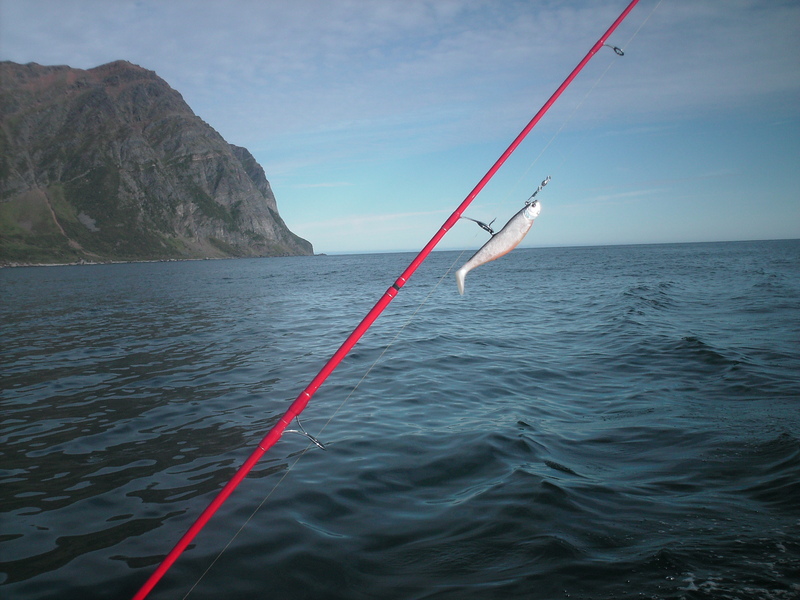 The sounder was full with fish as rod after rod bent down seawards drags screaming for mercy……too late your in Norway now Boy !!! Cant really describe the fight as the different emotions that go through your head is just crazy. The concentration level induced a severe headache, constant adjustment of the drag, rod position, body position,jelly fish getting caught in the line, the fish suddenly changing direction, watching out for swells etc. 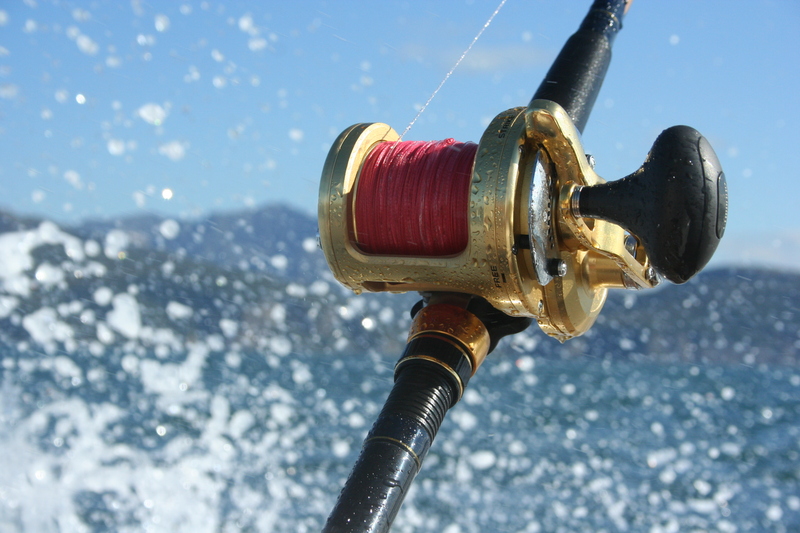 ‘Are ya snagged on the bottom Barry?’….’Yep’… Barry’s Rod bends down hard as the boat drifts away from the snag. 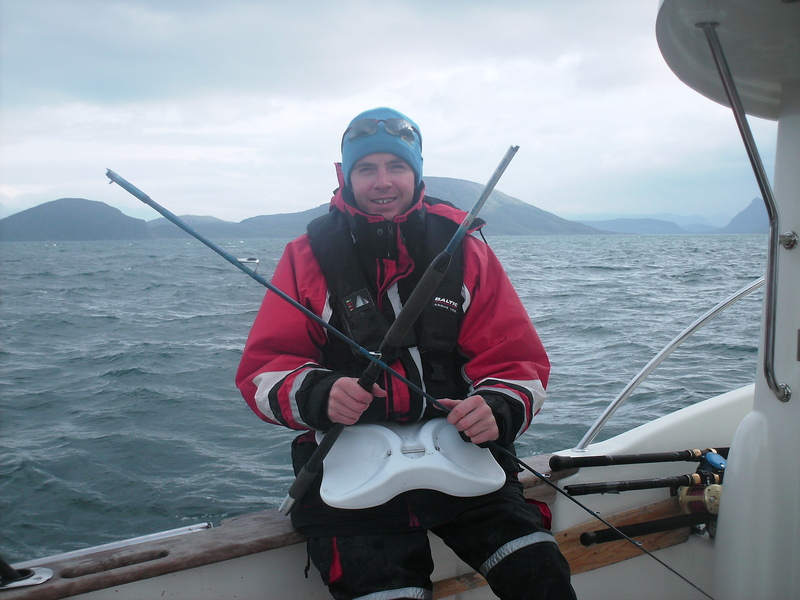 Up we rise on a large swell ….BANG… Seriously sounded like a gun had just been let off in the boat, ears ringing and Barry standing there with a big smile holding a now 3 piece Wave Blaster ! Want to break a rod? Call this man! 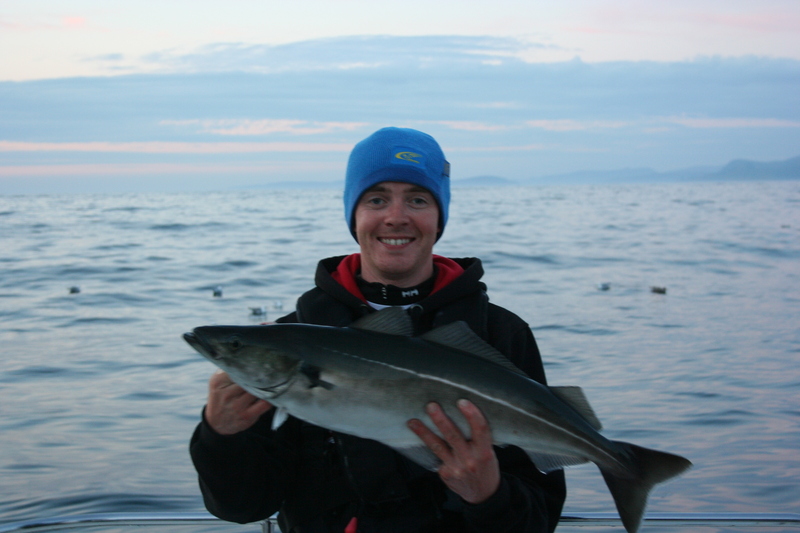 Conclusion: A Great trip, we all had great craic and met fellow anglers from the UK who were Halibut hunting too. On the whole it was agreed by the lads we spoke in the camp that we did very well up there especially on the Halibut front. We had 12 in total, we will be back up there again in a couple of years.Thanks to Northen Colin and his lads,Nick Plum off WSF for the pointers and the GPS co-ords, This time we could get to some of the co-ords provided by you guys. Id highly recommend going up here to anyone considering it. Again the only draw back is the travelling you need to do to get there. YOUR NEXT ONE COULD BE YOUR BEST ONE !! This is what you pay your money for ! 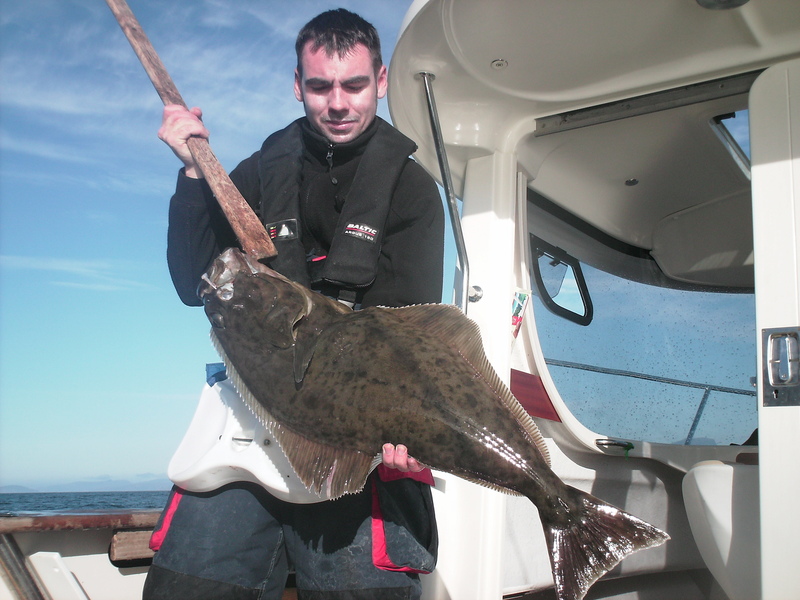 Hello lads,going to be fishing on the 21st sept,any halibut marks would be greatly appreciated…..This is my third trip and have had Halibut on both trips previous.Straight out of the harbour behind the small island,slightly to the right,had one there to 100lbs and a baby 5lb, using a wiggler pirk with a white muppet.The other lads are Skjervoy virgins, can’t wait to see there faces light up with the Cod. I will email you details when I finish work this evening OK.
Well……it was worth the wait!!! Great pics Danny and a great story told. I know it took hours (days) to compile and re-size pics etc so thanks for the effort in order to share. Aye, you will have to join us next time ! 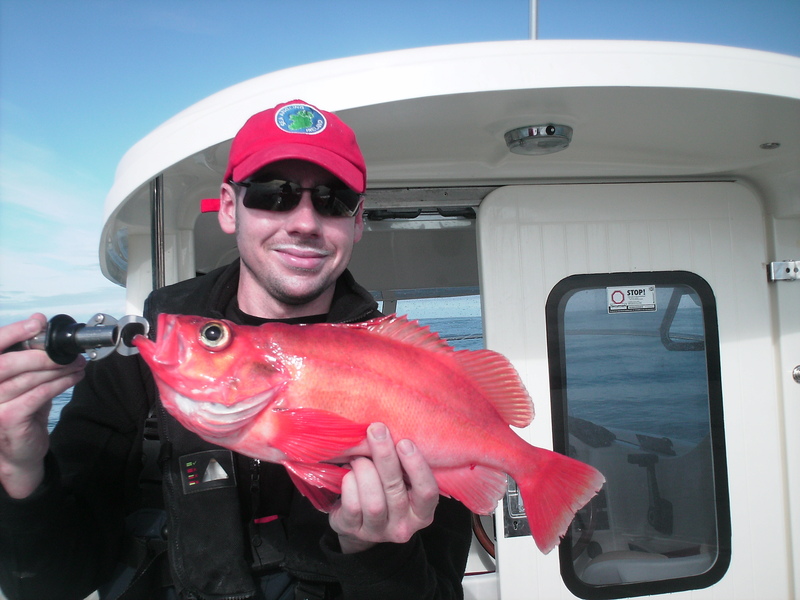 Fnatastic fishing, great report and photos, makes me green with envy. Puts the fishing in ireland into perspective!!! Thanks Frank, Yeah the Norway folk know how to look after their fish stocks. Thank God because I wouldn’t be able to stick the heat to fish the tropics, I burn quicker than petrol !! Well worth the wait, savage pics and a great report!!! Very nice lads!! Cheers James. ya gotta yourself up some time man, its some experience. Really impressed guys. That was some serious skill getting that baby up on the mix! Cheers Steve, hope you enjoyed reading it. I need to back up there for the buzz ! Hi John, yeah thats no bother, give me a shout when your back sure. The scenery up there is spectacular alright, well worth the visit. 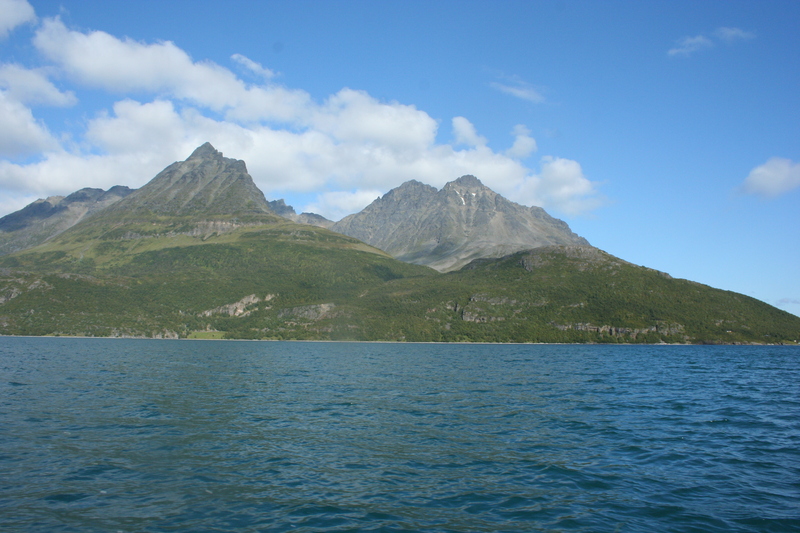 Did you take the ferry tour around the fjords? Morning Declan, thanks for the comments. I will dig out my notebook and I will email the ordinates on to you OK. Morning Willie, thanks for the comments. Great trip alright. 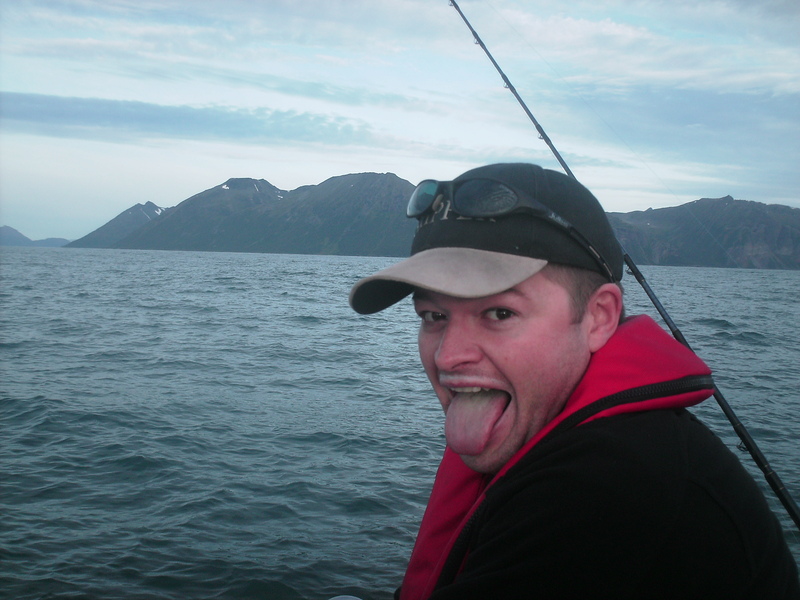 Still though im looking forward to the fishing down in Kilmore on the soft plastics from next month on ! Great Craic. Really good report and what a mix of weather. Found another great destination especially March April for monster cod but it has to be skippered fishing (special boat and skipper too!!). 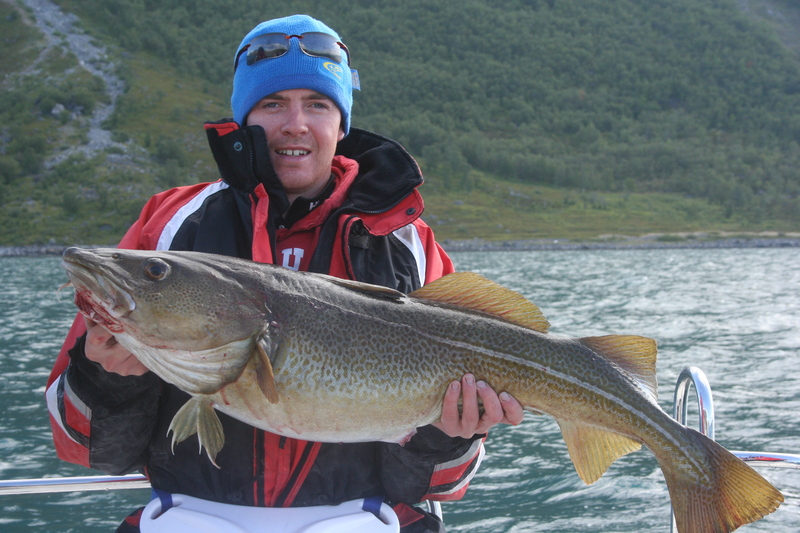 Had 2 days with Dave Lewis and 3 Norwegian anglers, 1st day lots of cod but nothing bigger than 40, secoind day crazy… numerous cod into the forties, 10 in the 50’s, 2 in the 60’s and the biggest 73 and a half pounds (weighed). Dave’s arms were dropping off”!!!! DVD out soon. Keep up the good work, hopefully I will get chance to fish with you again. How are you keeping Sir. That sounds like epic fishing there with Dave. Fish touching the 70lb marker is something special indeed ! It sounds good, email me I will go over it with the lads. I will have a look and see can I pull out the Co-ordinates for you. Good point on the clothing, from T shirts to flotation suits in the space of a couple of hours, it is extremely unpredictable on the weather front. They are some mighty fish! Hi Geordie, thanks for the comment. I will do up an email there over the weekend and il send it on to you. That is a very impressive Coal Fish ! Thanks Danny, yes it was a great fish in three months we had 3 records for the UK. 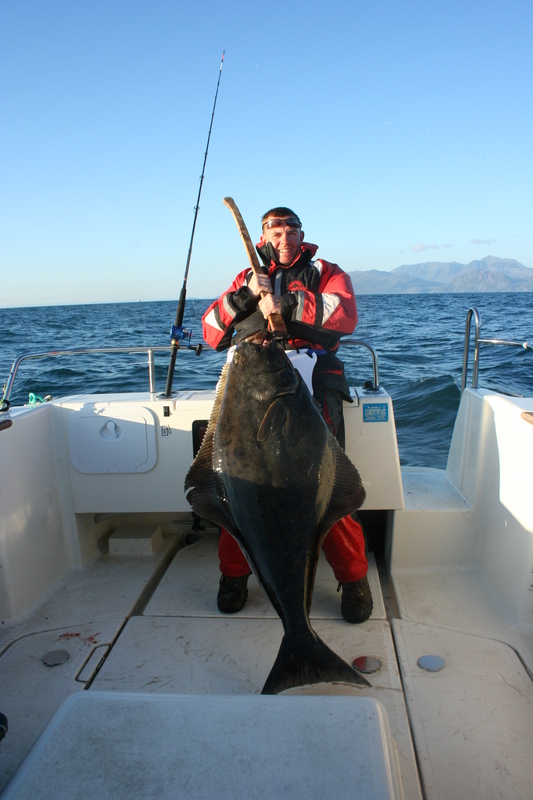 First was one of 32 lbs, then a 35lbs then the Current record of 37 lbs Caught by John Brown who now lives in Newcastle. 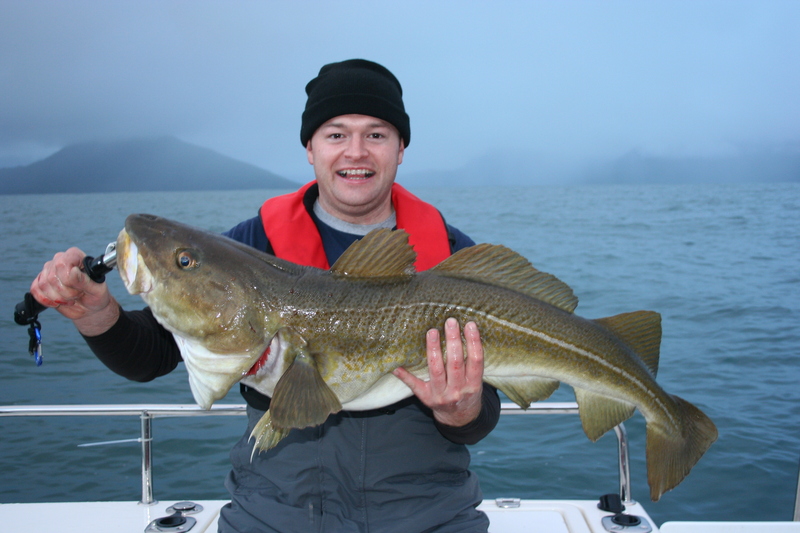 Caught my 35lb 4 onz fish some 5 years later, which is the second largest caught in the uk. But it wasn’t fair realy as being a skipper was out at sea every day.We may now be going over on 28 Sept subject to date being available. just found out 28 August not available so are now looking at 4 sept 2012. which is free.. But this will depend on if we can get the party together for those dates. May have some places available if anyone interested. Booking two Avors no more than 3 per boat. Great stuff Danny nice to see you caught what you set out for. Did you just use lures to catch the Halibut. I’ve been trying on 3 occasions without a sniff of one. Any advice would be greatly appreciated. Apologies for the late response, been a bit busy of late. I will do up a mail for you, could you send me your email address please.